A pound of dried beans, rice, or coins can be substituted for the pie weights. In order for the potato cake to hold together, it is important to slice the potatoes no more than 1/8 inch (3 mm) thick and to make sure the slices are thoroughly dried before assembling the cake. Use a mandoline slicer or the slicing attachment of a food processor to slice the potatoes uniformly thin. Place potatoes in large bowl and fill with cold water. Using hands, swirl to remove excess starch, then drain in colander. Spread potatoes onto kitchen towels and thoroughly dry. Whisk 4 tablespoons butter, cornstarch, salt, pepper, and rosemary (if using) together in large bowl. Add dried potatoes and toss until thoroughly coated. Place remaining tablespoon butter in heavy bottomed 10-inch ovenproof nonstick skillet and swirl to coat. Place 1 potato slice in center of skillet then overlap slices in circle around center slice, -followed by outer circle of overlapping slices. 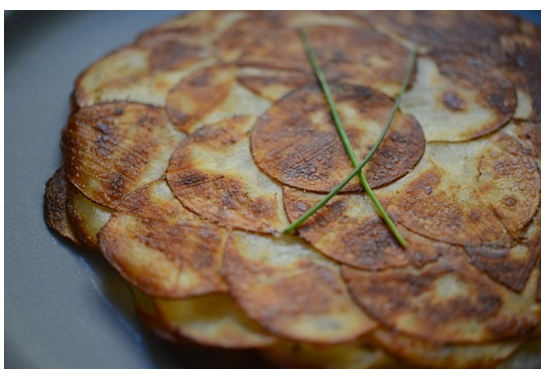 Gently place remaining sliced potatoes on top of first layer, arranging so they form even thickness. Place skillet over medium-high heat and cook until sizzling and potatoes around edge of skillet start to turn translucent, about 5 minutes. Spray 12-inch square of foil with nonstick cooking spray. Place foil, sprayed side down, on top of potatoes. Place 9-inch cake pan on top of foil and fill with 2 cups pie weights. Firmly press down on cake pan to compress potatoes. Transfer skillet to oven and bake 20 minutes. Remove cake pan and foil from skillet. Continue to cook until potatoes are tender when paring knife is inserted in center, 20 to 25 minutes. Return skillet to medium heat on stovetop and cook, gently shaking pan (use potholder—handle will be hot), until galette releases from sides of pan, 2 to 3 minutes. Off heat, place cutting board over skillet. With hands protected by oven mitts or potholders, using 1 hand to hold cutting board in place and 1 hand on skillet handle, carefully invert skillet and cutting board together. Lift skillet off galette.